When the winter winds are howling outside, there’s nothing better than curling up next to the fire. However, real fireplaces are off limits to some of us; especially those with small children or without the correct ventilation. 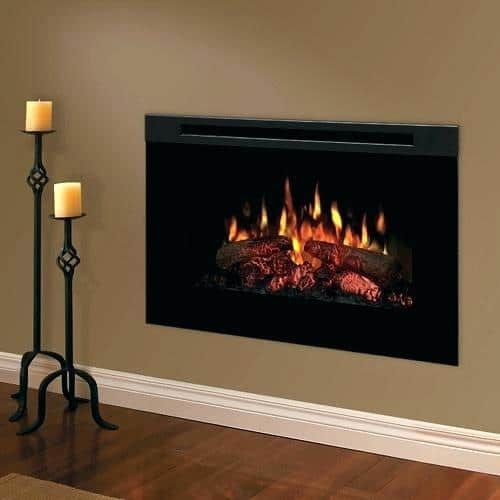 Luckily, technology nowadays means you can easily slot an electric fireplace insert into your existing fireplace. This easy plug-and-play installation gets you up and running in no time. You can keep your toes warm by the fire with the glow of flames dancing on the walls. 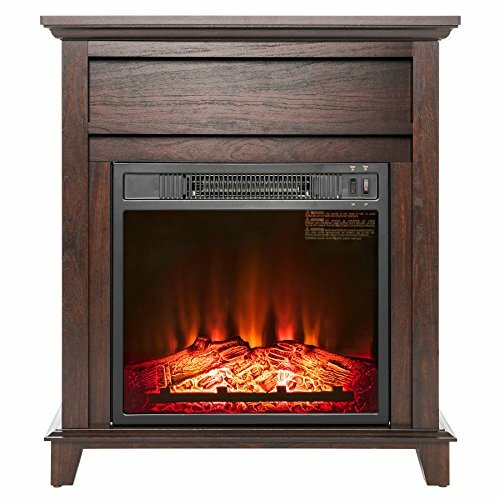 First, you need to choose the type of electric fireplace insert that will fit best in your fireplace. This will depend on the aesthetics you are looking for and the space you have available. The three main types of inserts are electric log sets, built-in, and plug-in. Electric log fireplace inserts are little sets of faux logs. They are designed to be as realistic as possible and sit on a set of legs, to look like a fire in a trough. They slot into your fireplace and plug into a standard 110v outlet. The logs give off radiant heat, with some including a fan to circulate this heat. If you’re installing your insert into a mantlepiece or a cupboard, you'll want a plug-in electric insert. These fireplaces look like enclosed fires with a glass front, and they slot into your existing feature and plug into a standard socket. You will find radiant and infrared versions of this model. If you're in the process of upgrading the whole fireplace and mantlepiece, you may consider a built-in electric fireplace insert. They are installed using a builder’s box and are more of a permanent feature. They can be hardwired or plugged into a regular socket. But require a little more installation skills than the other two models. When selecting a heater you must consider the size of the space you intend to heat. Measure your room first and consider the BTU output of the heater. If you get a heater with too much power, you’ll waste energy. Something too small simply won't do the job. 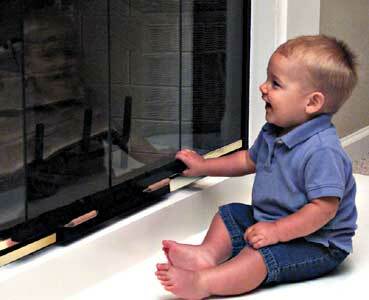 If you have small children or pets, then the safety features of your heater are likely to be a big concern. You want to look for an insert that is cool to touch just in case a pet or child gets their hands on it. Those with glass fronts tend to be cooler. You might also consider looking to overheat protection to reduce fire risks in the household. Remote controls should have child locks to help prevent the heater from being turned on accidentally. If you are installing the heater by yourself, you may need something that doesn’t require much vocational skill. However, if you’re reconfiguring the whole look of your space, you may want to install something more complex to improve styling. If you want a more grandiose electric fireplace insert installed but don’t have the skills yourself, you may have to pay someone to install your fireplace professionally. The overall style that you are trying to achieve will determine the fireplace that you choose. If you are happy with the log effect, you’ll find it easy-to-install. Whereas the enclosed fire style needs more skill. Moreover, look at the wood effects, colors, and trims to see how neatly it will complement your existing furnishing. Upfront pricing will always give you a realistic understanding of what you can place in your home. Also remember to consider the cost of running the heater. Look at reviews from other customers and remember to select a fireplace that can cope with your heating requirements. Take a glance over our guide outlining some of the best electric fireplace inserts on the market. We give an in-depth overview of some advantages and disadvantages to help you decide which model fits your requirements and where to look for a good deal. 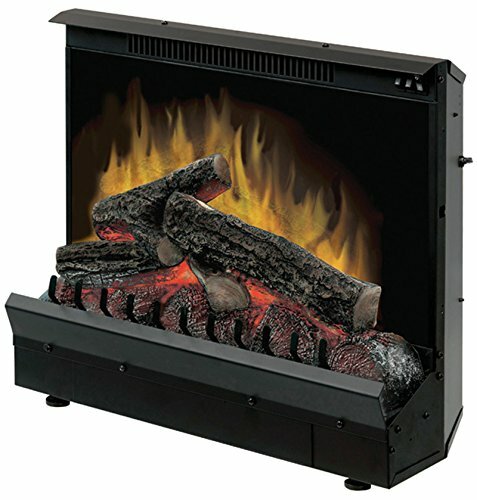 This 33-inch insert features energy saving LED technology to light up the resin logs. It has 3 sides of the brick wall and an adjustable thermostat. It is easy-to-install and plugs into a regular 110v socket. This easily heats up 400 square feet of space. The LED light technology uses very little energy. It is simple to install and needs no extra hard wiring. It has precision controls and thermostat for better temperature control. The model is a little small for most rooms. The logs are not as realistic as they appear in the picture. ​This compact design kicks out a lot of heat and has excellent control settings. The energy saving lights also make it energy efficient. 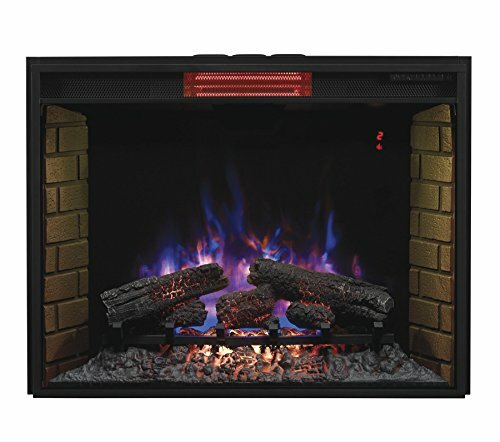 With 8900 BTU of heat output, this fireplace insert heats large spaces up to 800 square feet. It has a remote control and wall-mounted thermostat. The flames can be turned on without the heat, and the brightness can be adjusted. The remote control thermostat is very convenient. The flame effect has five settings for a more comforting feel. The flames can be used without the heat to improve the room’s aesthetics. The electronic timer helps to keep a comfortable temperature in the room. The motor makes a small whirring sound. The flames are not very bright, even on the highest settings. Though not all that bright, the wide glass panel gives a realistic flame look, while this fireplace insert comfortably heats large spaces. The flame effect has five settings, and the remote control makes this heater easy to use. It is a firebox insert with a curved front glass panel. It has an electric flame technology for realistic flames. It can be placed in pretty much any existing fireplace and can be plugged into a standard electrical outlet. This fireplace insert is super easy-to-install. This heater has a safety shut-off to prevent it from overheating. The electric flame technology is patented, giving some of the most realistic flames. The unit is loud when the fire is playing without the heat. You cannot turn the fan up or down to change the speed; it only has on/off settings. An easy-to-install model, this heater has good safety features and realistic fire. It is a little noisy, but the fan does help to spread the warmth more evenly around the room. 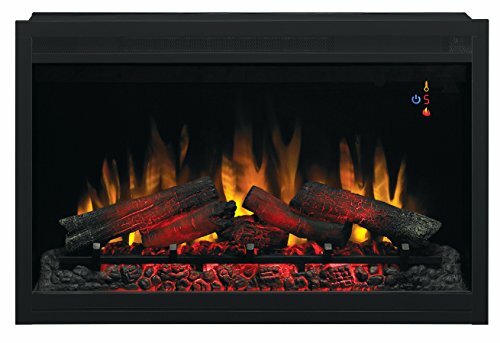 A 1375-watt log-style electric fireplace insert, this model has a patented flame technology and can be controlled remotely. It comes with a built-in fan-forced heater and has 3 heat settings. The heater comes with a year’s warranty. This device is very easy-to-install in any room. The fan allows air to circulate giving a more even heat. The heat has three settings which allow variable heat in different seasons. It is very economical to use, using less energy than more sophisticated models. The logs are not the most realistic looking. The remote control doesn’t have much range. ​More of a basic heater, this model is an economical choice for those looking to quickly install a heater. The fan is a little loud, but it enables smoother heating. Heating up to 1000 square feet with 5200 BTU of heat output, this model is for large spaces. It has 125 selectable flame effects to set the atmosphere and works using infrared. There is an adjustable thermostat, and the flame can operate without heat. Infrared is very energy efficient. The infrared technology works silently. It can heat really big rooms very easily and quickly. There are 125 flame settings which enable you to create the ideal mood in your home. It is a little loud when you turn the blower on. 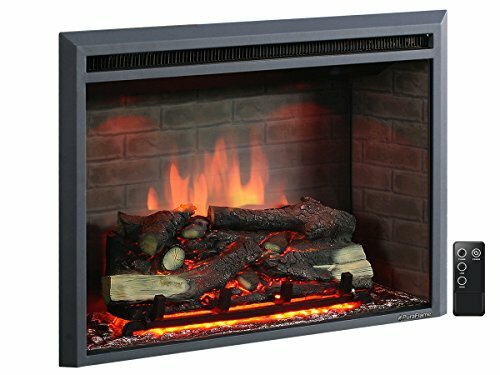 This fireplace insert is significantly more expensive than other models. With energy efficient infrared technology, this insert heats a large room quickly without guzzling energy. There is a wealth of fireplace effects, but beware that the blower is a little loud. Choosing a fireplace insert can give you a lovely homey feel without the hazards of a traditional fire. 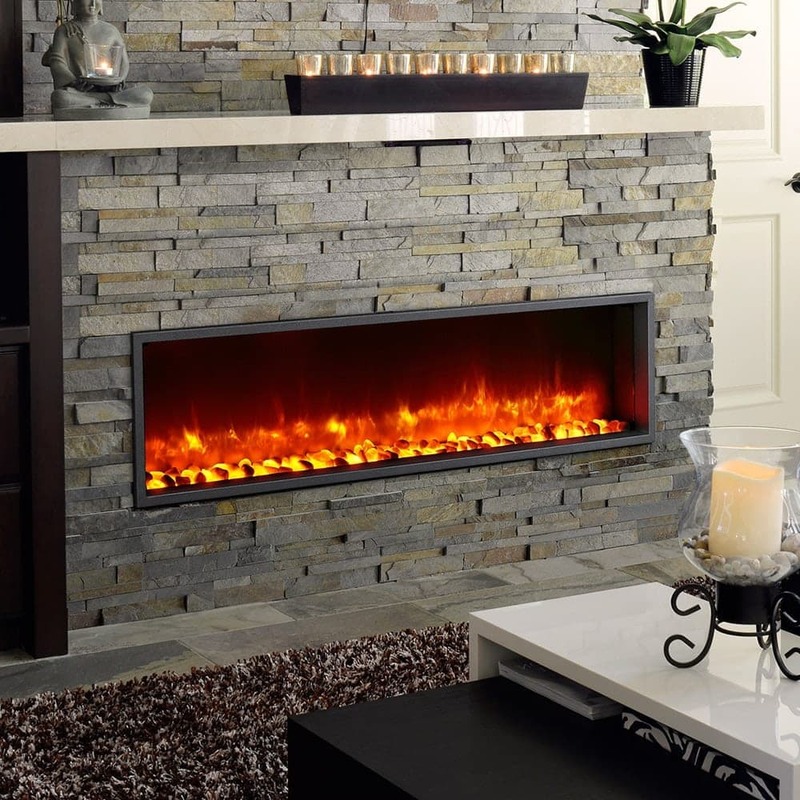 The design you choose will be determined by your existing electric fireplace. So make sure to measure it and understand your installation needs. Think about the energy costs of running the model, and consider infrared choices as energy efficient options. Remember to check out the safety features. Especially if you have little hands in your household, that may accidentally touch your fireplace insert!